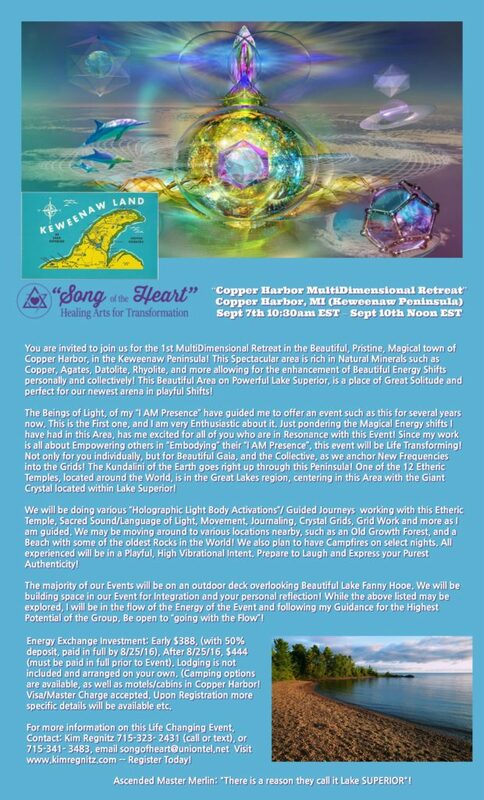 You are invited to join us for the 1st MultiDimensional Retreat in the Beautiful, Pristine, Magical town of Copper Harbor, in the Keweenaw Peninsula! This Spectacular area is rich in Natural Minerals such as Copper, Agates, Datolite, Rhyolite, and more allowing for the enhancement of Beautiful Energy Shifts personally and collectively! This Beautiful Area on Powerful Lake Superior, is a place of Great Solitude and perfect for our newest arena in playful Shifts! The Beings of Light, of my “I AM Presence” have guided me to offer an event such as this for several years now. This is the First one, and I am very Enthusiastic about it. Just pondering the Magical Energy shifts I have had in this Area, has me excited for all of you who are in Resonance with this Event! Since my work is all about Empowering others in “Embodying” their “I AM Presence”, this event will be Life Transforming! Not only for you individually, but for Beautiful Gaia, and the Collective, as we anchor New Frequencies into the Grids! The Kundalini of the Earth goes right up through this Peninsula! One of the 12 Etheric Temples, located around the World, is in the Great Lakes region, centering in this Area with the Giant Crystal located within Lake Superior! We will be doing various “Holographic Light Body Activations”/ Guided Journeys working with this Etheric Temple, Sacred Sound/Language of Light, Movement, Journaling, Crystal Grids, Grid Work and more as I am guided. We may be moving around to various locations nearby, such as an Old Growth Forest, and a Beach with some of the oldest Rocks in the World! We also plan to have Campfires on select nights. All experienced will be in a Playful, High Vibrational Intent. Prepare to Laugh and Express your Purest Authenticity! The majority of our Events will be held on an outdoor deck overlooking Beautiful Lake Fanny Hooe. We will be building space in our Event for Integration and your personal reflection! While the above listed may be explored, I will be in the flow of the Energy of the Event and following my Guidance for the Highest Potential of the Group. Be open to “going with the Flow”! Energy Exchange Investment: Early $388, (with 50% deposit, paid in full by midnight 8/28/16), After 8/28/16, $444 (must be paid in full prior to Event). Lodging is not included and arranged on your own. (Camping options are available, as well as motels/cabins in Copper Harbor! Visa/Master Charge accepted, Upon Registration more specific details will be available etc.